Andros is the most northerly, and the second largest (after Naxos) of the Cyclades. 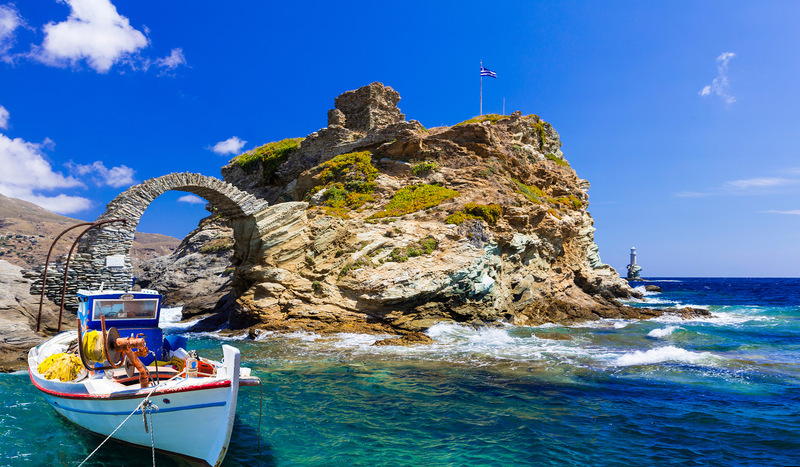 Some people believe that Andros, just a couple hours by ferry from Attica at the port of Rafina, is not the tourist magnet many of the other Cycladic Islands are because there are a number of very wealthy ship owners living there and they want to keep its beauties for themselves. Reportedly, the only place in Greece with more ship owners than Andros is Piraeus. At any rate, Andros's tourist infrastructure is arguably one of the least-developed of the island group, and its citizens don't seem to care all that much. Which is a boon for the casual traveler from abroad, since Andros can be enjoyed in all of its un-touristy, unspoiled splendor. Instead of large, self-contained resorts, you get small mom and pop-type pensions. Instead of masses of drunken 20-somethings and the pulsing, throbbing beat of Euro dance and techno pop, you get the quieter, bouzouki and accordion strains of rembetiko. Instead of the sight of people throwing up on the streets and urinating wherever and whenever the mood suits, you get the sound of quiet clinking of wine glasses and of knives and forks scraping every last morsel of grilled fish, sauce, and green salad from a perfectly laid table of traditional Greek fare. A rule of thumb in any tourist destination is, "do the locals frequent it?" 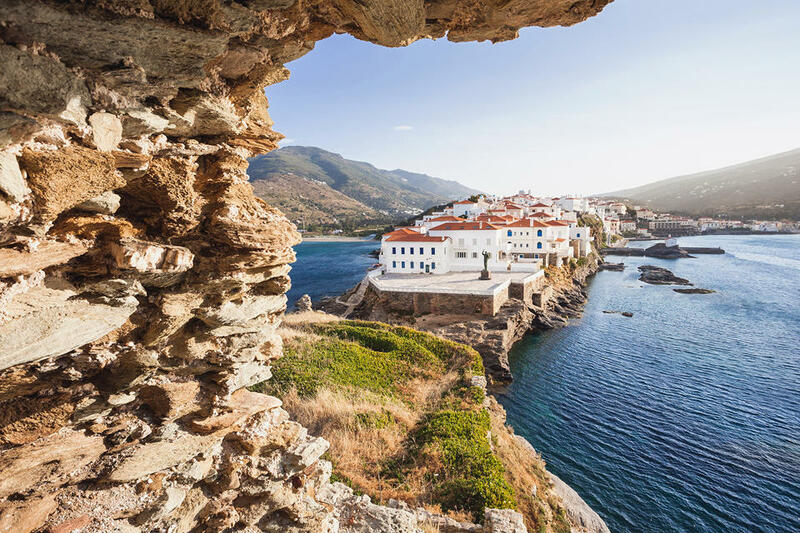 In the case of Andros, the answer is a resounding "yes," both because of its closeness to Athens, and the very fact that it has so far ducked the hyper development of other island destinations in the Aegean. Geographically, one could argue that Andros doesn't properly belong to the Cycladic group at all; like a large, long stem which ruins the fat circularity of a pumpkin, its sticking-out-to-the-north-like-a-sore-thumb routine does a lot of damage to the roughly circular arrangement of islands with Delos at its center. But neither does it belong to any other grouping- it would just sit out there, unassociated with Evia, which is its own large entity, across a 10km-strait to the northeast, and Tinos, a member in good standing of the northern Cyclades, across a much narrower 1.2km strait, to the southwest. All 3 islands are longer than they are wide, and sit on a northwest-southeast axis. There was a Late Stone Age (3,000 BC) village on the west coast of Andros named by its excavators after the plateau on which it sit, Strofilias, which is around 20km down the coast from the main port city of Gavrio, and about 2km due west of the modern village of Zaginiaris. Older (but not much older) than the Bronze Age Cycladic culture (3,200-2000 BC), Strofilias is one of the oldest fortified places in Greece. Preserved rock carvings of various wild and domestic animals have been found, as well as one depicting a flotilla. Sometime around 1,000 BC, Andros was colonized by Eretria, and energetic city-state on the nearby island of Evia, but as it gained in strength it begat its own colonies in Halkidiki, 300km to the north. The ancient capital Palaeopolis (Old City), 5km up the coast from Strofilias, and 15km down the coast from Gavrio, has supplied many artifacts, and has extensive ruins (including a well-known temple to Dionysus), indicating a large, prosperous population center. Palaeopolis sided with the Persian king Xerxes during his second invasion of Greece in 480 BC, straining its relations with Athens for the next 150 years. In the first century of the Hellenistic Age (323-31 BC) the city-state (and Andros) was in the center of a tug-of-war between two powers that had inherited 2 of the 4 geographical divisions of Alexander the Great's empire, Macedon and Ptolemaic Egypt. After that it fell to the combined powers of Rome, Pergamum, and Rhodes, in 200 BC, until 133 BC, when it became the sole possession of Rome. During the thousand-year existence of the Byzantine Empire (330-1453 AD), Andros does not figure much in the events of that part of the world. It was, however, captured in 1203 by soldiers of the 4th Crusade. During the next 363 years, the history of Andros is a very complicated story of being possessed various Venetian and Genoese families. The Ottoman Turks took over in 1566, and, as elsewhere in the Cyclades, the Ottomans ruled with a relatively light hand, giving the islanders a lot of autonomy, which included low taxation and religious freedoms. Andros was taken over and used as a base by the Russians during the Russo-Turkish War of 1768-74. Andros finally regained its independence, and became part of the greater Greek state after the Greek War of Independence (1821-32). Instead of the almost starkly barren appearance of the other islands, Andros is relatively well-watered. There are 7 mineral water springs on Andros with reputedly therapeutic effects on those who drink it. As a matter of fact, the first foreign tourists to the island in the 1800's came because they had heard of the curative powers of the waters from these springs. 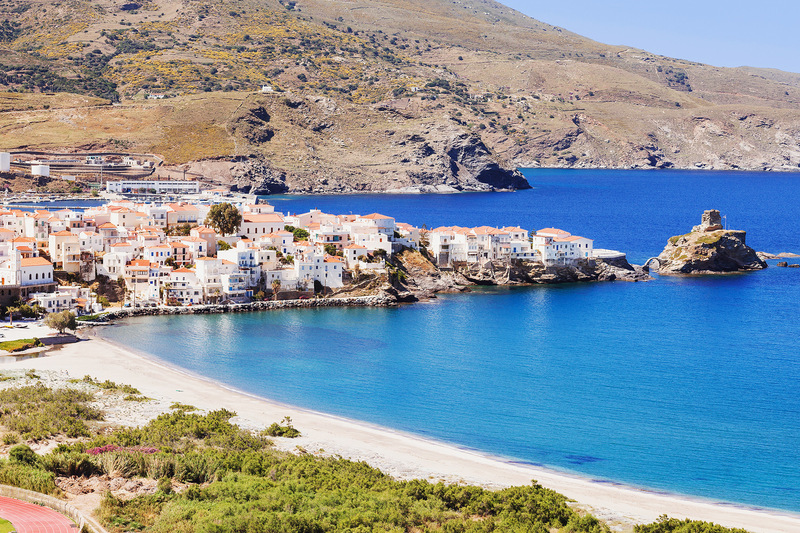 The most famous is in the village of Apikia, 3km northwest of Andros Town, or Hora. There the water from the spring named Sariza is bottled and sold all over Greece. It's supposed to heal kidney and stomach problems, and is a diuretic. There is a Venetian-era fountain in the middle of the village in the shape of a lion's head, with water pouring out of the mouth. The east side of Andros gets the most rainfall. The island is geographically defined by four mountain masses oriented east-west, the tallest of which, at 1,000m, is Kouvara. Andros is also divided by 4 small rivers flowing along the same axis, which create valleys between the mountain masses. These valleys grow the kinds of trees you don't usually find in abundance on the other islands, such as mulberry, fig, chestnut, plane, apple, pine and cypress. The vegetation is a lot sparser on the higher elevations both because of poorer soil and constant high winds. The terrain does not allow for a lot of bottom land, so over the millennia farmers have terraced many hillsides, building retaining walls of dry-stack, slate-sized schist, which are also used to demarcate property lines. They are also used in the island's architecture. The coastline is wild and rocky, with many small, sandy coves ideal for a bit of private swimming and snorkeling. Rafina, the point of departure for Andros, is 25km east of Athens. From there it's another 60km by ferry to Gavrio, high up towards the north end of the west coast of the island. Gavrio itself is really not much to look at, and cannot be considered a tourism center. There are some nice beaches to the south of town, however. Gavrio is a serviceable enough entry point to Andros, and it's easy to get busses taking you to more scenic places. One of those is Batsi, about 7km down the coast, and the most touristically developed place on Andros. That being said, it is nothing like some of the highly developed villages on other Greek islands. For campers, Batsi is the only place offering an organized camp ground. Batsi is a medium-sized tourist town which fills up with northern Europeans on budget package tours every summer. It has its fair share of night clubs and beach bars, and it's the place to go on Andros if you're in your 20's and wanting to party a bit. Fortunately for those who favor a slower-paced, quieter type of holiday, Batsi offers that, as well. Batsi has a nice little marina, and, next to that, the town beach, which is a decent and convenient place to swim and sunbathe. Just a couple kilometers north of Batsi, between Kipri and Agios Petros, is the most Chryssi Ammos (Golden Sand) Beach, the best beach on Andros. It is well organized, and offers various water sports. The sand is just as the name of the beach implies: soft, golden, and rock-free. The water is incredibly clean, with that beautiful shade of aquamarine that characterizes so many beaches on the Greek islands. I'll get back to other places of interest on Andros for the average tourist, but I want to take a little archeological detour, since all the important stuff is here on the west side of the island. On a headland overlooking Agios Petros, just a little north of Batsi, is the Tower of Agios Petros, the 20m-tall, cylindrical remains of a taller structure dating from the 300's BC, which was long before St. Peter (Agios Petros) was born. The tower takes its name from the village, which was founded much later. As a watchtower it is superbly sited. It has a commanding view of the sea to the west, towards mainland Greece, of the nearby islands of Kea, Siros, and Kithnos, and of the surrounding countryside. It is the best-preserved ancient monument on Andros. There is a hiking trail up to the tower. Continuing south down the west coast of Andros, there are 3 more archeological points of interest: Ypsili, Paleopolis, and Zagora. Ypsili, a few kilometers south of Batsi, just before the village of Kato Aprovatou. The citadel was discovered in the early 1980's. A temple foundation dedicated to Demetra has been uncovered, as well as walls, buildings and a number of artifacts, all dating from the Geometric to Archaic periods (900-489 BC). Access to the site is near the main road. It is the only organized archeological site on Andros. Paleopolis is about 9km down the coast from the Tower of Agios Petros, and it was the main population center of Andros from around 1,000 BC up through the early Byzantine years, around 600 AD. Its acme was a 700-year period starting about 500 BC. Ano or Upper Paliopolis is built on the steep western slopes of Mt. Agioi Saranda (40 Saints) overlooking the sea at an elevation of 200 meters. The ancient city continued on down to the seaside, where presumably it had its port. A number of artifacts found at Paliopolis can be seen at Hora, or Andros Town, on the east coast. The city's defensive walls still survive. Zagora, another 5km south of Paleopolis, like Paleopolis, commands the heights overlooking the sea to the west. Its peak came during the Geometric period (900-700 BC), and remains of defensive walls, a large gate, house foundations, and a temple have all been excavated. The town did not have a long life; it was inhabited only for a few hundred years, although the temple was used as a place of worship into the Classical era. The archeological museum of Hora contains finds from this site, as well as models of a home and temple. Getting to Zagora requires a 40-minute, very scenic hike which is well-posted with signage. Hora is the island's capital and the chief point of interest on the east coast. Hora is first, foremost, and always, a seafarer's town. This long, narrow village (1,500m long and 200m wide) is interestingly configured because it is built on the floor of a narrow valley and continues onto a rocky tongue of land projecting 500m into the Aegean, like the prow of a great ship. At the very tip of the peninsula is an islet connected to the mainland by the flying stone "kamara" or arch, on which the ruins of the Venetian castle sits. Beyond the islet is a pillar of rock in the middle of the water, on top of which is perched a lighthouse. In the platia at the end of the peninsula, just before the islet, is the statue of the "Unknown Sailor," depicted as a man with a sea bag over his shoulder, his free hand up and hailing someone in greeting. The view of the rest of the village, and of the sea to the east, from the heights of this platia, are a photographer's dream. There is a second platia further inland, more traditionally surrounded by cafes and restaurants, with a plane tree throwing its shade on visitors. The village is full of neoclassical mansions, mixed with more traditional, cube-shaped Cycladic-style homes. Some of the mansions are owned by families who owe their fortunes to the shipping industry, and centuries of sea trade. There is a wonderful archeological museum housing artifacts from the various sites on the island, most of which are on the west coast. There is also an interesting nautical museum, in addition to a museum of modern art. The town beach is below the village, just to the south. There is a second town beach just to the north of the peninsula offering sun beds and umbrellas. Hora is a must-see for visitors. There is a really wonderful network of hiking trails on Andros. There are over 100km of such trails, many of them sort of lanes between the previously mentioned dry-stack stone walls bordering the properties on Andros. They are maintained by an all-volunteer group, and vary in level of difficulty from very short and easy, to more challenging walks. Many of them offer tremendous views of the surrounding countryside, or dip into glens and dales in the valleys, or spectacularly skirt cliff faces along the coast. Some of them are really ancient paved roads. There is a great hiking path from Batsi to Paliopolis on the west coast. It's 11.5km long and requires a degree of fitness to manage. Some of the path is very old, and paved with cobblestones. It also passes by waterfalls at Ano Paliopolis. Google "hiking trails on Andros" for more info. 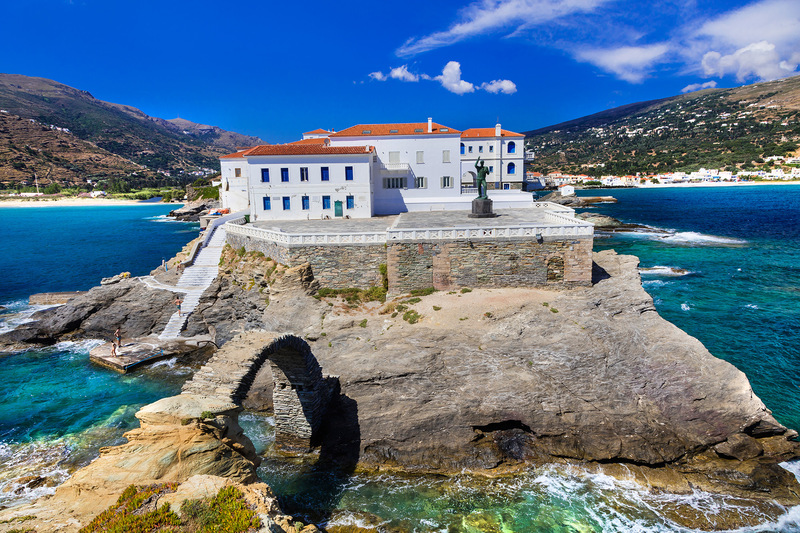 Andros is one of the most interesting Greek islands. It has a little bit of everything for you, minus the hordes of tourists. 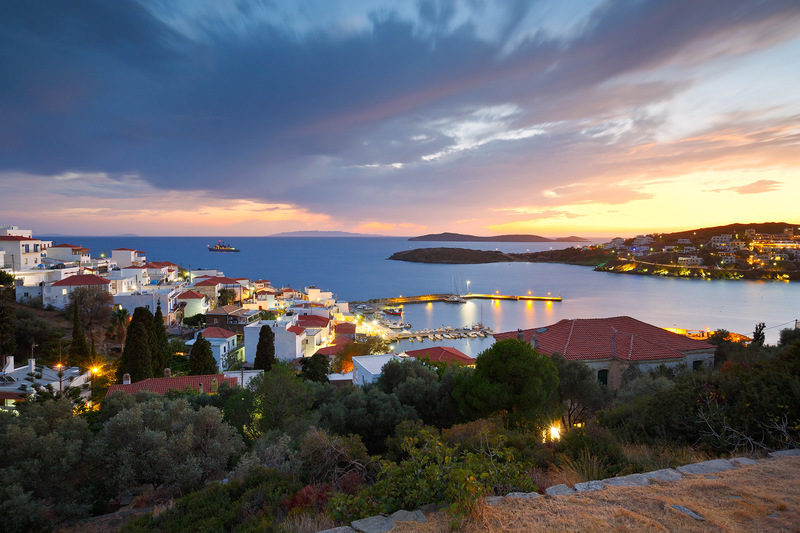 Its closeness to Athens makes it well worth even a short visit.